Naples’ only beachfront resort with on-site golf (no shuttle required), tennis, spa/salon, and water recreation, couple with casual dining and bar options, there is something for everyone. 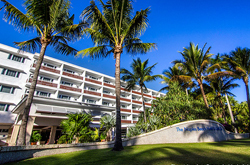 The Resort has spent in excess of $40 million in renovations over the past few years and continues to delight guests of all ages and provides a great venue for vacation, business, meeting or social event. 317-guest rooms and suites at the Naples Beach Hotel & Golf Club are situated along 1,000 feet of beachfront; are located throughout six residential-style buildings offering either a view of the Gulf of Mexico or resort view. In-room amenities include flat-screen television, refrigerator, coffee maker/coffee/condiments, phone w/voice mail, robe, safe, iron/board, hair dryer, bath amenities and most with a patio or balcony. In-room wireless internet service is available for a fee. In keeping with our environmental awareness the Resort offers recycling and other green initiatives for our guests and proudly is a certified member of the Green Lodging Program. Guests enjoy several dining options throughout. HB’s on the Gulf, our beachfront restaurant and winner of Wine Spectator’s ‘Award of Excellence’ winner since 2005, serves breathtaking views, fresh seafood and daily specials for lunch and dinner. Reservations are suggested. The Everglades Dining Room serves both an a la carte menu and buffet daily. Our newly expanded and renovated Sunset Beach Bar and Grill was named “Best Beachfront Bar in Naples” by Travel Channel now serves a casual lunch and dinner on a new courtyard, multiple televisions for viewing your favorite sport or event, and check our website for updates on entertainment. Poolside, serves up cold drinks and light fare overlooking the pools and beach. The Seminole Store offers breakfast, lunch, dinner with light fare of sandwiches, salads, and to-go items. Be sure to visit the dessert and ice cream counter! For those who want a more private setting, in-room dining is available. Get out and enjoy all of the recreation options. Our 18-hole, par 72, golf course is available to both resort guests and the public. Renovations included tees and greens in 2010 and fairways in 2011. Six Har-Tru tennis courts are available for singles, doubles, or if you need assistance in pairings let us know and we will match you with another. Clinics, individual or group instruction is available for both golf and tennis. The beachside complex of two swimming pools (family pool and adult only pool) is available to resort guests only. Chairs and towels are provided poolside. Chairs, loungers and umbrellas are available on the beach for rent. The Spa and Salon are also available to resort guests, public and also offers a membership. From massages, facials and body treatments, to full-service hair, make-up and nail salon, the experience is luxurious. Resort guests also enjoy the use of our fitness facilities. Yoga classes are available for an additional charge to guests and public. Our young Resort guests (ages 5-12) will have a blast in our complimentary Kids Club. Available daily from 9:00 am to 4:00 pm. Lunch may be included for an additional charge. Additional services and outlets in the resort include ATM, concierge, barber shop, and retail shops. The Resort also offers meeting and event space for meetings, conventions, weddings and other special occasions. We are Naples' premier destination wedding location with a unique combination of indoor banquet facilities and outdoor venues. From romantic sunset weddings on the Gulf of Mexico to elegant ballroom settings, we can accommodate your every need. Our friendly and professional staff is committed to making your day relaxed and enjoyable. For your convenience, we offer a list of preferred vendors for all aspects of your wedding. From helping you find the right florist to the perfect photographer, we help turn your dream wedding into reality. Whether you have spent a lifetime on the sandy beaches of Naples, or just a weekend, we'll make planning your wedding a breeze.